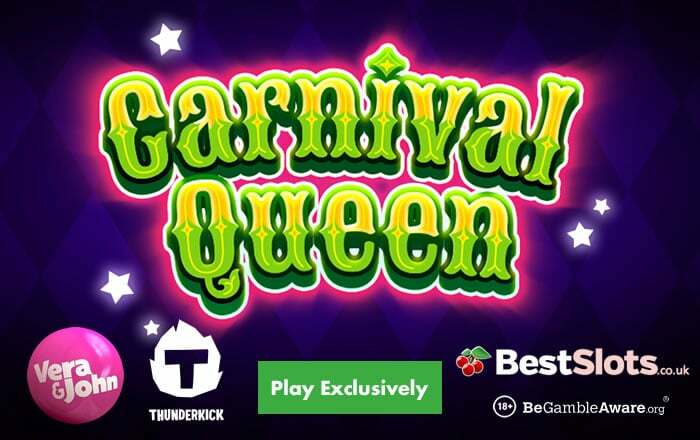 Thunderkick will be releasing Carnival Queen on the 20th of February (2019) – however, it’s been released exclusively early. Carnival Queen comes with 6 reels and 4,096 ways to win – it can be played from just 10p a spin on desktop, mobile and tablet devices. This game focuses on the world-famous Mardi Gras carnival and is all about eating, costuming and parading. Visually bright and fun, it comes with an Avalanche feature where winning symbols disappear to be replaced by new ones – thus giving you the chance to win again and again. With each Avalanche, the Multiplier feature kicks in with the multiplier going up by 1 with each win – this also features in the Bonus Game feature where you begin with at least 12 free spins. You can begin with 24 free spins if you get 6 scatters. If you get 2 or more scatters in the feature, you will receive additional free spins – the Multiplier feature doesn’t reset though and can only increase! If you get a losing free spin, a wild removes all symbols vertically and horizontally to give you another shot of forming a winning combination. Carnival Queen is a good slot which can give you wins of 22,700 times your stake on every spin/free spin – the likelihood increases in the free spins due to the multiplier that doesn’t reset. To try for free and read more details, visit the Carnival Queen review. Carnival Queen is exclusively available, until general release, at Vera & John Casino – with plenty of other new arrivals such as iSoftBet’s The Fortune Pig and Yggdrasil Gaming’s Cazino Cosmos, you are welcomed with an exclusive offer. You will get 20 no deposit bonus spins on Thunderkick’s Zoom when you sign up – then there’s a 100% bonus up to £50 when you make your first deposit.